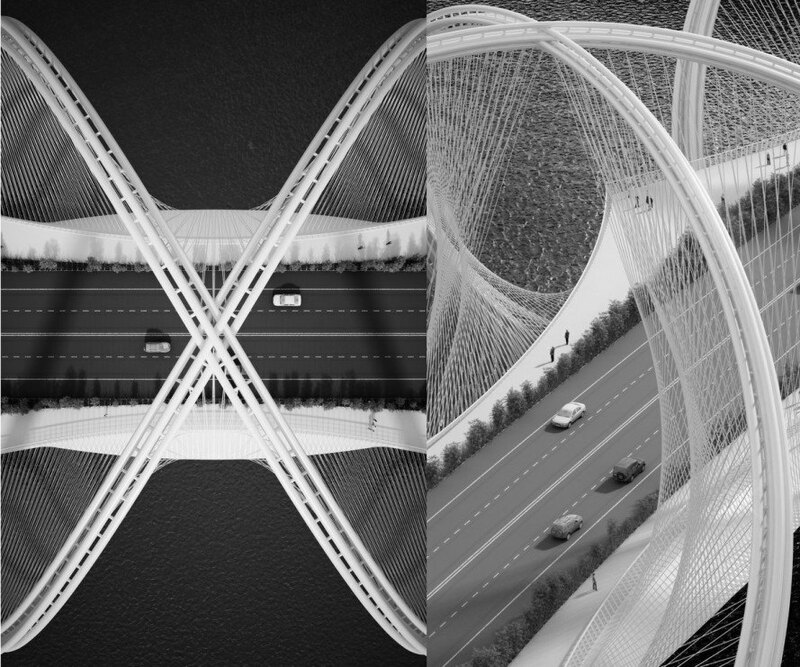 Penda's latest bridge design features a series of double-helix arches inspired by the rings of the Olympic Games. The San Shan Bridge would span the Giu River outside Beijing, China just in time for the 2022 Winter Olympics to be hosted there. Penda’s design concept draws from the elliptical, connected rings that represent the Games, as well as the five major regions of the world that participate in the competitions. The architecture studio, based in Beijing and Vienna, proposed this design as part of the larger infrastructure projects Beijing is undertaking in preparation for the Olympic Games. The bridge’s name—San Shan—means “three mountains” in English, which is meant to describe the three peaks seen when looking at the bridge from either side. The elliptical shapes connect and link together to create the bridge’s overall shape, dressed in stark white against the forested background and the muddy river water. 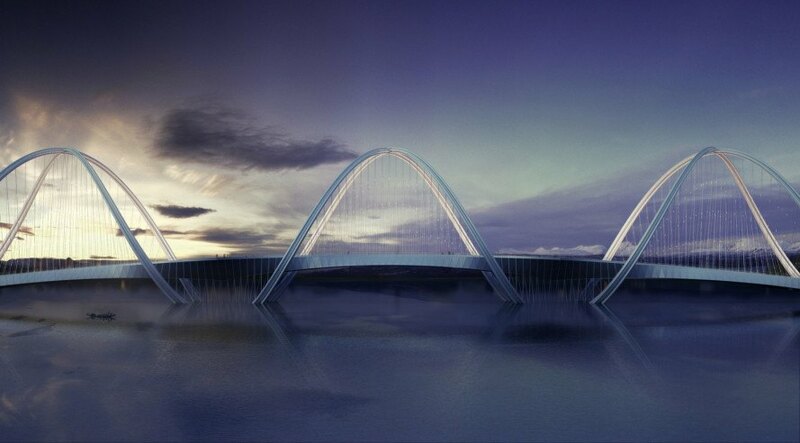 The bridge’s helix-shaped arches were designed and engineered by ARUP, the British structural engineering firm. Their contribution enabled the bridge’s design to use the thinnest supports possible (without sacrificing strength), lending to the bridge’s delicate aesthetic. The surrounding area will be transformed into a hub linking bustling Beijing with its surrounding lands, gearing up for the Beijing Horticultural Expo 2019 and the Winter Olympic Games three years later. Austrian architect Chris Precht founded Penda with Dayong Sun in 2013 after working together for several years. In the intervening time, the duo have elevated their international firm to global acclaim, winning awards for several designs along the way. This bridge demonstrates the epitome of their combined talent. The architecture studio, based in Beijing and Vienna, proposed this design as part of the larger infrastructure projects Beijing is undertaking in preparation for the Olympic Games. The bridge’s name—San Shan—means “three mountains” in English, which is meant to describe the three peaks seen when looking at the bridge from either side. The elliptical shapes connect and link together to create the bridge’s overall shape, dressed in stark white against the forested background and the muddy river water. 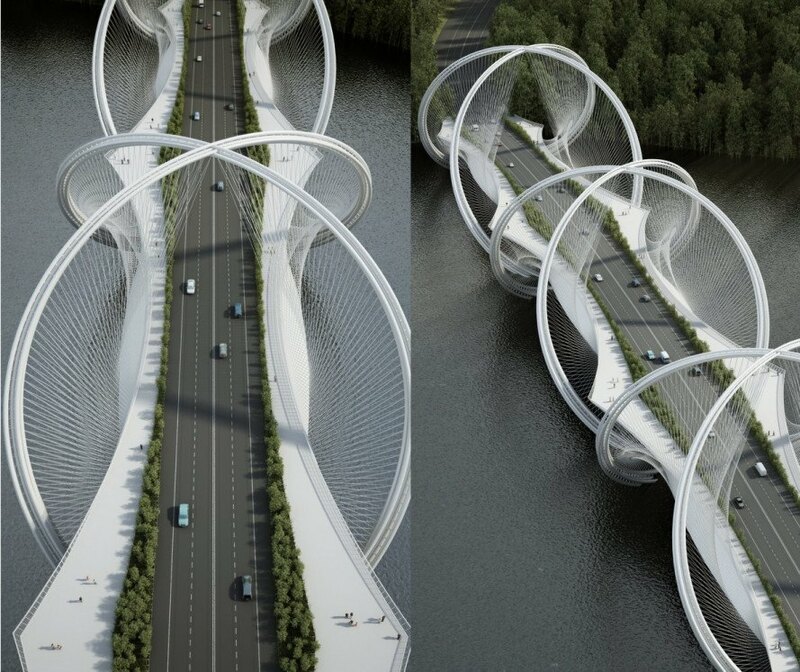 The bridge’s helix-shaped arches were designed and engineered by ARUP, the British structural engineering firm. Their contribution enabled the bridge’s design to be comprised of the thinnest supports possible (without sacrificing strength), lending to the bridge’s delicate aesthetic. The area expected to be the bridge’s home will be transformed into a hub linking bustling Beijing with its surrounding lands, gearing up for the Beijing Horticultural Expo 2019 and the Winter Olympic Games three years later. Austrian architect Chris Precht founded Penda with Dayong Sun in 2013 after having worked together for several years. In the intervening time, the duo have elevated their international firm to global acclaim, winning awards for several designs along the way. This bridge demonstrates the epitome of their combined talent.